Powers/Abilities: He could absorb and manipulate the light of life energies from living beings. He drained light from dying beings as well as from others. He could give the light to other living beings thereby giving them a glimpse of his own power. In a state of trance he could leave his body in an astral form (appearing as a glowing disc) to search for more light he could absorb in this form. It is unknown if the Lord of Light could use his stored light in an offensive way. (Strange Tales II#2 (fb) ) - Years ago he married Melissa Bowen and was happy with her. Their daughter Tandy was born and Melissa changed into a greedy materialist. Dagger's father fled from his wife for the sake of his own soul. (Cloak & Dagger I#4/Cloak & Dagger II#11 (fb) - BTS) - Dagger's father split off to India to contemplate his navel before Tandy was five. He made his wife happy by leaving her the estate. (Strange Tales II#2 (fb) ) - In India he studied with a series of gurus, but the light he sought eluded him. One day he approached a derailed train. Light fled from the dying people and infused him. Bursting with light he went to the Mountaintop Sanctuary of Lashi and established it as his own temple, pretending to help others get in touch with the light. For years the Lord of Light drained others of their light, first the dying, then others; and he stored that light in his followers thereby giving them the illusion of power while he waited to feed on them as well when he had to enough light to transcend to godhood. (Strange Tales II#1) - Dagger's father approached Cloak from behind and his touch filled Cloak with so much light that he was transformed back to his human form. Upon hearing Cloak stuttering again Dagger turned around and saw the disciples dropping to their knees before the Lord of Light. Dagger immediately recognized him as her father. (Strange Tales II#2) - The Lord of Light introduced his daughter to his disciples and she was happy to be reunited with him. Dagger danced around her father's spinning disciples and released light daggers into air. Her father told her that she could ascend to his level with the proper training. The Lord of Light siphoned away some of Dagger's light when his disciples weakened from showing their light and he refilled them with Dagger's light. The Lord of Light turned to Cloak and asked him if he had offended him, but Cloak was thankful for becoming human and left although he feared to lose Dagger forever to her father. The Lord of Light explained to Dagger that Tyrone left to find himself anew and then led her to his inner sanctorum. There the Lord of Light asked Dagger what had happened to her since he left her and her mother. When she blamed him for becoming Dagger, he told her why he had left his family and how he became the Lord of Light. Dagger wasn't sure about her father's power coming from him, but he told her that he had trained to become a proper vessel for the light which he took from the dying before it faded away forever. He liked to think that these people lived on in him. Dagger asked him what they should do with their light powers and her father's answer was an easy one: They would ascend to godhood! Dagger didn't like this because she wanted to help people with her light. Dagger left, and her father thought how easy it was for Dagger to get the light he hungered for, and he was sure that Dagger would help him to attain the light. The hands he laid on Dagger's shoulder glowed from the light he absorbed by touching her. Some time later Tyrone watched the Lord of Light giving more of his light to his disciples and he wondered if the Lord's disciples were just storage batteries. Even later he watched the Lord of Light and four of his disciples sitting in trance and letting loose their light forms. Tyrone followed their light forms and saw how they approach an injured woman and a child. Tyrone tried to stop the light forms because these people weren't dying, but the light forms didn't stop from draining their and Tyrone's lights. Tyrone was turned back into Cloak while the helpless child and woman died. Meanwhile Dagger entered the room in which her father and his disciples sat in trance. Cloak returned and told Dagger what had happened and she believed him. Her father's glow returned and he parted Dagger from Cloak. The Lord of Light drained more of his daughter's light to get enough power to kill Cloak when his disciples failed. They fought and Cloak pointed out that the Lord of Light was willing to kill his own daughter. When the Lord of Light realized that Cloak was right he admitted his lust for light and all the evils he did over the years. He restored his daughter's light and threw himself into Cloak where the Lord of Light set free all the light he had stolen over the years. The Lord of Light disappeared inside Cloak and was devoured by the Predator within the Darkforce dimension. Lord of Light's sacrifice once again cut Cloak off from the Darkforce dimension, transforming Cloak back into Tyrone Johnson. Dagger's father was first mentioned in Cloak & Dagger I#4. After that nearly exact the same phrase (he split off to India to contemplate his navel) was used over and over again to talk about him (ex. Cloak & Dagger II#2). The only mentioning standing out from the others was in Cloak & Dagger II#11 wherein the reader learns a more exact date to when Dagger's father left his family. In this issue he was also "seen" for the first time when Dagger imagined a Christmas play her father attended. His totally different look (dark hair, beard etc.) could be attributed to Dagger not remembering him too well because she was too young when he left her and her mother, but this would contradict that she recognized him immediately in India. Let's play it down as an artistic mistake (or Dagger's state of mind at the time)! I'm not sure if the Lord of Light could use the light he had stored in an offensive way against normal people, but he tried it against Cloak which didn't work because Cloak just absorbed it. The Lord of Light's death wasn't a definite one. IMHO he is just waiting for a return, but nobody (authors) shows any interest in him and so the Lord of Light will stay in comic limbo (or a hippy community). His real name was revealed in Marvel Atlas#1. 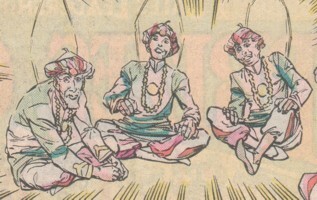 (Strange Tales II#1) - Some of the disciples were in Lashi when a ferry capsized. The drowning victims were drained of their life-light by their astral forms. They stared at Cloak and Dagger when they saw them on land, and Dagger realized that they were somehow different than the other people. They closed in on the heroes, and Cloak teleported away with Dagger. Dagger saw the light discs again, and she followed them with Cloak to the Temple of Light. They light discs returned to meditating disciples and Dagger saw how they enjoyed the light. Dagger gave them more light while Cloak drew back from the glowing disciples until their leader touched him. The disciples kneeled down before their leader. (Strange Tales II#2) - The present disciples were introduced to Dagger by her father and their master the Lord of Light. Some disciples began to whirl until they fell in trance and the light within them manifested itself as a glowing disc. They weakened soon, but the Lord of Light reloaded them with Dagger's light. Tyrone stayed with some disciples while Dagger talked to her father. Some time later Tyrone watched how disciples were filled up with light by the Lord of Light. Even later he watched the Lord of Light and four disciples falling into a trance and releasing their light forms. Tyrone followed them and his light was drained by them as well as the light of two innocents. The lights returned to their possessors and the four disciples attacked the returned Cloak when he opposed the Lord of Light. Cloak drained their excessive light and then released them. The disciples ran away after their master disappeared inside Cloak. 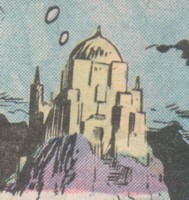 The former Mountaintop Sanctuary of Lashi, the city of heavenly delight, was turned into the Temple of Light by Dagger's father. The disciples had enough space to live and meditate. The Lord of Light himself lived in a luxurious inner sanctum with everything he desired. Meditations and refills mostly took place in the main hall from where the glowing discs could fly directly through the main entrance.